I just finished my marina knit cowl pattern and I'm totally in love with the colors and the yarn. And it's a lovely quick to knit project just in time for the Fall season. If you enjoy cowl knitting you'll really like this easy knitting pattern. I didn't want the knitting to get too boring so I added some textured knitting stitches to it for some interest. The trim on the marina cowl scarf is made with the seed stitch pattern and the body of the cowl is made with the lovely dot stitch pattern. It's a pretty little cowl scarf isn't it? I think it's the lovely colors. The marina cowl is a great knitting idea for holiday gifting too, after all we're inching up closer to holiday knitting. 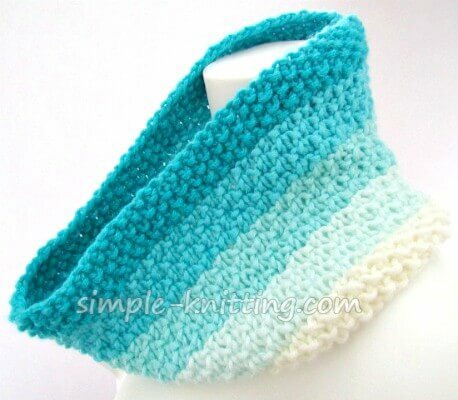 And who wouldn't love this knit cowl scarf? It's knits up pretty fast too, a couple of evenings and you'll have it finished or if you're a fast knitter it may only take you one evening to make it. 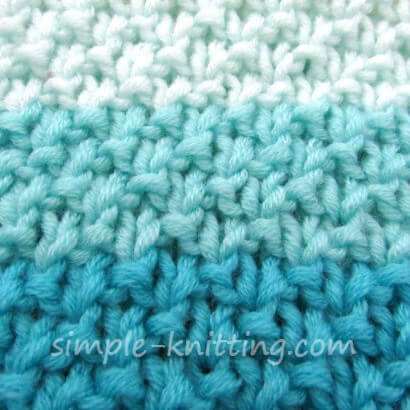 This is an up close look at the stitch pattern I used called the dot stitch. It's quite lovely isn't it? And by the way the dot stitch is a great stitch pattern for sweaters. It's even simple enough to incorporate into a plain simple knit sweater pattern if you wanted to spice it up a little bit. Oh and I just wanted to mention the yarn I used for my knit cowl pattern because it's fairly knew and it's so pretty. And the yarn is wonderful to knit with. It's from Yarnspirations and it's called Caron X Pantone. The yarn comes in a braid like this and all the colors are matched for you. Yay! It's also the perfect amount for a knit cowl pattern. I'm not the best when it comes to figuring out color choices so I love this idea. Now it's decided for me and lets me get started knitting faster. There's 127 yards (116m) which was just perfect for my knit cowl pattern. One thing to note when you try this new yarn. Each piece of the braid is in a mini hank so be careful when you take it apart. In case you're a beginner knitter, you'll need to make yarn balls out of each piece of the braid. If you start knitting with it before it's made into a ball of yarn it'll get all tangled and you won't be able to use it. What I did is laid out each piece of the braid in a small circle since there isn't a lot of yarn in each mini hank. Then I just started winding the yarn into a mini ball of yarn. I hope you enjoy my marina knit cowl pattern as much as I did making it. Gauge: 3.25 sts and 5 rows = 1 inch Gauge isn't too important. Notes: I used two stitch patterns for the Marina Cowl, seed stitch and dot stitch. You can use different colored yarns or simply make it plain. I used Caron X Pantone and just love the yarn! Also if you're going to use different colors like the Marina cowl make sure that you change colors on a knit row which are rows 1 and 3. Why? That way the new colors will simply flow into each other and it won't look inside out. Of course if you don't mind it showing through then simply change colors as needed. Also, I added two extra stitches in order to create a selvage edge. It'll make it easier to seam the ends together. With first color cast on 86 sts using the long tail cast on or your preferred cast on. Proceed in the following pattern changing colors either on row 1 or 3 as needed. For instance if you're using another color after working the seed stitch, switch it now and proceed with the first row. Note: I changed colors after 6 rows so I knit the 4 row repeat and then row 1 and 2 then changed colors for row 3. Continue knitting in pattern until you reach 1 inch before the top and ending on row 2 or 4. With final color knit across row. Then proceed in seed stitch for 6 rows. Weave in ends and seam ends together. Then simply enjoy!